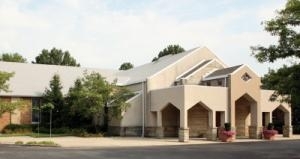 St. John Paul II Parish, with 3,147 parishioners, was established from the merger of St. Barnabas and St. Pius Parishes. parishes: St. Pius, St. Martha and Ascension. For the growing enrollment, four classrooms were added to the school building in 1956; another four were added in 1959. By 1960, there were more than 1,000 students. When part of St. Barnabas became St. Martha in 1960, third graders were bused to the empty classrooms at St. Martha School. School began at “St. Barnabas Annex” (later Ascension School) in 1964. In 2006, St. Barnabas School joined with St. Pius School and St. Bartholomew School to form a regional school, called John Paul II Academy. After a Lent of special prayers and a requested doubling of contributions by parishioners in 1960, Father Gallagher called forth a commitment to tithing that replaced school tuition and all fund-raising activities. Under Father Gallagher’s spiritual inspiration, the successful tithing experiment enabled the parish to set a budget sufficient for operating expenses, debt retirement, efficient school programs, funds for expanding parish facilities, and the financial obligations of the various parish organizations. Also, through this plan, parishioners developed a spirit of cooperation and of reliance on the providence of God, which continues to this day. St. Pius X served the rapidly growing Catholic population settling in Buechel-Hikes Point at its establishment in 1956. Father Charles Foltz, the founding pastor, and Archbishop John A. Floersh agreed upon the name honoring Saint Pius X, called “The Children’s Pope,” for lowering the age when children could receive First Communion. Like the saint, Father Foltz greatly loved the Eucharist, and at one time the parish was known for the city’s largest number of communicants. Parishioners celebrated Mass at “Saint Goldsmith,” a building across the street from where the Father Foltz and the “parish pioneers” worked side by side building a concrete church, which was dedicated in December 1956. St. Pius School opened in the 1957, staffed by the Sisters of Charity of Nazareth. The priest and parishioners built an enduring legacy of collaboration and spirituality. The Altar Society sponsored card parties in homes to buy linens and china for the rectory. A parishioner fashioned the stone cross near the school entrance. The Booster Club built the bleachers, the addition to the cafeteria, the press box, and an athletic field. In 1987, a new community center was constructed, and the old convent housing parish offices was renamed the Sarto House. The church was renovated and was rededicated on May 31, 1987. St. Pius X School has educated two generations, supported by adult volunteers. In 2006, St. Pius continued its strong legacy of Catholic education by joining with St. Barnabas School and St. Bartholomew School to form John Paul II Academy. Parishioners reach out through mission trips to Guatemala, eastern Kentucky, and West Virginia. Their caring, welcoming spirit extends to the community at large. The founding parishioners and priests planted seeds of faith that took root. After fifty years of leadership, sacrifice, cooperation, and caring, the faith of the parish has taken wing.